Synthetic Grass Is Not Dirty! There is a common misconception that synthetic grass is not as clean as regular grass. Today’s synthetic grass, however, is the perfect middle ground between high maintenance naturally turfed lawns and the stale AstroTurf of yesteryear. Nowadays it is possible to achieve the fresh, ever-green look without having to compromise on hygiene or invest your time and money in constant upkeep. Let’s bust some common myths about the synthetic alternative. Fact: Artificial grass has gotten a bad rap because, when neglected, it looks and feels sub-par. It does require some looking after. There are, however, only three simple steps to maintaining fantastic synthetic grass: regularly remove debris, rinse occasionally especially in dry climes, and keep the fibres well groomed. This minimal upkeep is still considerably less intensive than the seeding, mowing and watering a natural lawn requires. Fact: Maintaining a synthetic lawn only requires an occasional raking, sweeping, or once over with a leaf blower. If your synthetic grass is outdoors, chances are that organic matter (leaves, dead bugs, the occasional animal dropping) will eventually find its way onto your lawn. If left sitting, these materials can break down and harm the grass. Fortunately, you don’t need any expensive tools to keep your grass looking fresh because the best method for removing detritus is using a good old fashioned rake which will not only clear debris but rearrange the fibres to ensure the blades of grass remain erect and wear evenly. Fact: Bacteria, which is not commonly found in synthetic grass, is the cause of most unwanted smells. 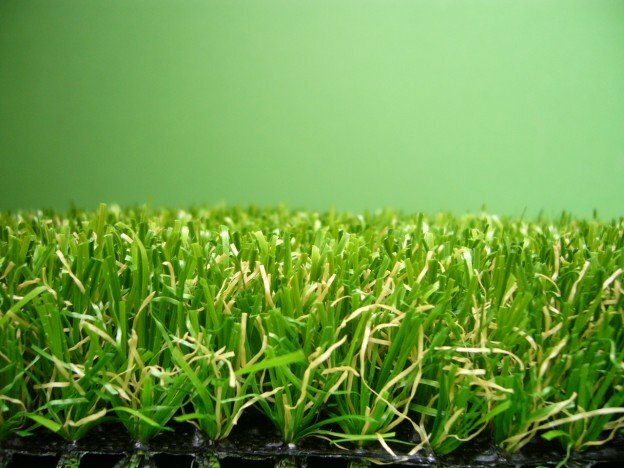 A well maintained area of fake grass will not grow bacteria because, unlike natural grass, fake grass does not contain anything for bacteria to feed on. Myth: You should avoid using synthetic grass if you have pets. Fact: Cleaning a pet’s mess off of synthetic grass is as simple and hygienic as cleaning in other household areas. If your pet starts to favour a particular spot on the lawn to do its business and there’s been no rain for a while, use a bucket of water to freshen up the area. For big jobs, there’s always the hose but be sure not to disturb the in-fill by getting the nozzle to close. Fact: Even if you don’t notice a spill straight away, water based stains (soft drinks, milk, alcohol, coffee, tea, juice, sauce, blood, juice, mustard, butter, urine) can be easily removed by simply rinsing your grass with warm soapy water. Tougher stains (grease, cooking oil, sunscreen, ink, nail polish, shoe polish) can be cleaned off by carefully using some mineral spirits. For chewing gum use eucalyptus oil. Even if you do encounter a stain that you can’t remove yourself, or you accidentally burn or melt a portion of your turf, it is easy to fix or replace a damaged area of synthetic turf. Fact: Modern synthetic turf is specifically designed to stop mould. A common misconception is that synthetic grass systems are like carpet which remains damp and grows mould if left wet. In reality, synthetic grass consists of the top blades, and a porous base with in-fill (usually sand). This means that, when installed properly, synthetic grass actually drains and dries quicker than natural grass, which is a much larger facilitator for mould growth. In the unlikely event that you do find some mould spots they can be easily removed by rinsing the area with a small amount of hydrogen peroxide then water. Fact: Rather than damaging or discolouring you synthetic turf, using a standard weed killer once a year on your synthetic turf will actually help lengthen the life span of your product. Because artificial grass is atop a porous base, there will occasionally be a weed or two that comes through. When you use weed killer instead of pulling weeds out you can simply brush away dead weeds instead of pulling them through the base and disturbing it in the process. Fact: Synthetic grass actually doesn’t reach its optimum condition until two to three months after installation. This is because the in-fill needs to penetrate the fibre file and settle into the turf’s structure. For this initial “bedding-in” period regular light brushing with a broom is recommended to keep the blades upright and even.